The earliest recognition of a tumour (pronounced as 'liu' in Chinese) was recorded over two thousand years ago in the book of 'Nei Jing'. This book recorded the causes of disease, the symptoms and treatment including surgical resection and medicinal treatments. 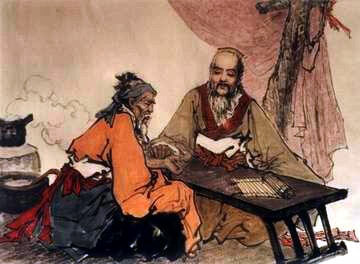 The earliest recognition of cancer was recorded in the Chinese ancient medical book called ‘ Wei Ji Bao Shu’ in 1170. Since then, the cancer has been recorded and discussed in many Chinese ancient medical books, including various methods of treating different types of cancers. The Western medicine to treat cancer is surgery, chemotherapy and radiotherapy, the aim is the destruction of the tumour. But it is well known that chemotherapy not only destroys cancer cells, but also attacks healthy tissue such as the mucosal lining of the digestive tract, the red cells and particularly the white blood cells, which result in weight loss, malnourishment, extreme fatigue, depression and infection. Studies also showed that even after maximum chemotherapy, about 0.1% of the tumour cells still survive. Therefore a high risk of recurrence and metastases will exist for the ensuing 2-7 years. Chinese herbal remedies can offset the side effects caused by the chemotherapy, it can increase the blood cell production, digestive absorption and reduce toxicities, this can prevent patients from infections after major surgery or chemotherapy, it also helps the patients to recover more quickly. The anti-cancer remedies developed in our Clinic have been used since the late 1970s. They are not only unique but have also proven to be effective. When used along with chemotherapy treatment, it can 1) enhances the effectiveness of the chemo treatment; 2) increases the White Blood Cell count during the chemotherapy treatment, which not only reduces the risk of developing infection but also helps patients to complete the course of chemotherapy; 3) increase the appetite, which reduces the risk of developing anaemia and leads to faster recovery. The history of our Anti-Cancer remedies can be traced back to the 1970s. One of our family members was diagnosed with colon cancer (stage III) in 1971, the patient didn’t want to have surgery to remove part of her colon, even though the surgeon told the family that without surgery the patient had six months to live. The patient decided to try TCM remedies first. Two and half years later, the patient was still alive, her condition didn't deteriorate as predicted, people around her began to doubt if she had cancer at all, so she decided to stop taking the remedies. In October 1974, the patient’s cancer progressed rapidly and needed immediate surgery. After surgical resection of the tumour, the family was told that a small section of the cancerous part couldn’t be removed due to some technical difficulties, a small nodule (less than 1cm ) was also found in the liver during the operation, cancer cells ware also tested positive in one of the 14 lymph nodes removed. 3 to 6 month life expectancy was given. The patient started taking Chinese remedies again immediately after the surgery. A few years later, the patient took an ultrasound scan which showed her liver was normal, no nodules were found in the liver. In 1999, this patient was again diagnosed with breast cancer in the UK and had it surgically removed. The patient didn’t accept the chemotherapy and radiotherapy treatment, but continued with our TCM remedy therapy only. Since being diagnosed with cancer in the 1970s, this patient has been actively involved in the process of developing our anti-cancer TCM remedies, helping other cancer patients and encouraging them that it is possible to live a life with the cancer. Today at the age of 75, this patient also enjoys gardening, fishing, walking, etc.